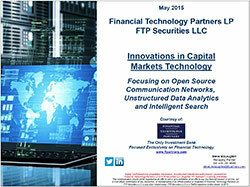 Financial Technology Partners regularly publishes detailed research highlighting key trends driving market activity across the FinTech Landscape. Our research and analysis has been featured on Bloomberg, the Wall Street Journal, Dow Jones and the Financial Times and is regularly viewed by CEOs and industry leaders. 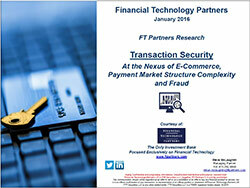 FT Partners' unique insight into FinTech is a direct result of successfully executing hundreds of transactions combined with over 17 years of exclusive focus on the FinTech sector. Follow FT Partners on Twitter and LinkedIn for real time updates, and subscribe to FT Partners' Monthly FinTech Market Analysis for the industry's most comprehensive and detailed updates on the FinTech sector. 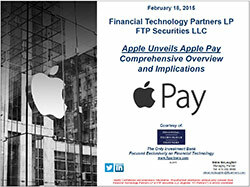 Each report published by FT Partners contains an in depth review of a unique area of the FinTech marketplace and is highly valuable and topical to CEOs, board members, investors and key stakeholders across the FinTech landscape. Each report is continually updated by the FT Partners Research Team with the latest information, facts and metrics to provide our readers with the most up-to-date and comprehensive subject matter. The latest version of each report is provided below along with a brief overview of the report contents. 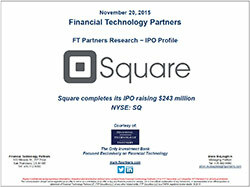 FT Partners’ FinTech Insights Reports are published on a quarterly basis, along with a comprehensive year-end FinTech Almanac. All information included in the reports is sourced from FT Partners’ Proprietary Transaction Database, which is compiled by the FT Partners Research Team through primary research and data analysis. The reports feature M&A, financing and IPO statistics and trends as well as breakdowns by FinTech vertical, geography, investor-type and much more. Be sure to check back for quarterly updates and additions. All recent reports can be viewed or downloaded for free. Over the course of 2018, FT Partners published numerous, exclusive CEO interviews with InsurTech start-ups innovating along the insurance value chain. The report features all 14 interviews from 2018 along with new, year-end updates from the CEOs. Today, while many companies offer free credit scores, few offer free credit monitoring, and even fewer offer key insights about what impacts consumers' credit worthiness. After getting access to their credit scores, consumers are often at a loss of what to do and are largely left on their own to make important credit decisions. This contrasts with the asset side of consumers' balance sheets where financial advisors and, increasingly, robo advisors are using data and analytics to alleviate consumers of the burden of making investment decisions for their specific goals. Consequently, we expect financial service providers to move beyond offering free access to credit information and move towards providing complete credit lifecycle management solutions that not only enable consumers to understand their credit profile, but also directly help them improve their scores and leverage their position in order to obtain the most optimal credit products at any given moment in time. Brazil is in the midst of a FinTech revolution as the confluence of a number of forces has created a very fertile environment for innovation and disruption across various financial, technology and business services. 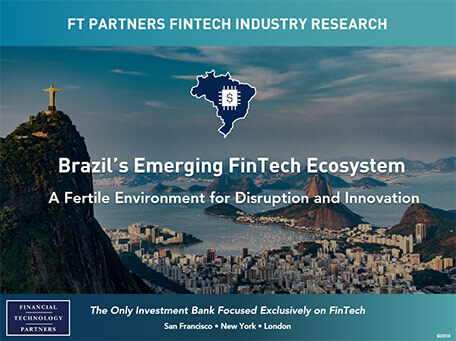 With the world’s fifth largest population, the eighth largest economy and a government encouraging greater competition for a highly concentrated banking ecosystem, Brazil represents a very attractive market and a huge growth opportunity for technology-driven financial solutions across Payments, Banking, Lending, Insurance, Wealth Management, and other sectors. FT Partners regularly conducts interviews with investors and executives of innovative and disruptive FinTech companies. Our interviews provide insights into different business models and future company developments, opportunities and challenges that FinTech executives face, as well as broader trends across the industry. FT Partners’ InsurTech Insights and Alamanc reports analyze financing and M&A data in the InsurTech sector. The reports include recent and historical financing volume and deal count totals, largest financing rounds, most active investors, M&A trends and more. 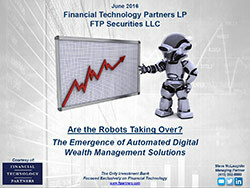 This report is an in-depth examination of the dramatic changes sweeping across the wealth management industry. The traditional investment management and registered investment advisor (“RIA”) industries are facing numerous threats, and while firms in the industry recognize the need to respond, technology-driven innovation is not a core expertise of most RIAs and investment managers. 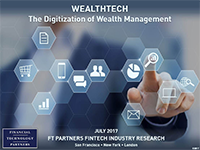 Consequently, there has been a groundswell of FinTech companies bringing digital capabilities to the traditional wealth management industries. Collectively, we label this segment of FinTech as WealthTech. Founded in 2005, Stockholm-based Klarna is now one of the most valuable privately-held global payment companies with 1,500 employees, 2016 revenue of $460 million (+42% year-over-year) and a recent valuation of $2.5 billion. Klarna began as an alternative payment method in Northern Europe, which enabled users to pay for online purchases following delivery of goods; today, Klarna works with 70,000 merchants to offer multiple payment solutions to more than 60 million users in 18 countries across Europe and North America. The report includes a detailed company and financial overview on Klarna, as well as profiles on other players in the space, Affirm and PayPayl Credit. FT Partners provides the broadest and most specialized coverage of FinTech with our comprehensive monthly sector-specific reports. Our depth of research and insight is unmatched in the industry and these reports are widely recognized and reviewed by top CEO's and investors in the market. Each monthly report includes sector-specific public company comparables, recent financing and M&A transactions and upcoming industry conferences and events. The latest month’s reports are available below; click here to subscribe. This in-depth report looks at the major waves of innovation and disruption that are beginning to radically alter the insurance industry. The insurance industry, unlike many other areas of financial services, has not yet been substantially disrupted by new technologies and transformative business models. However, the industry now appears to be at a key inflection point as many different constituents in the FinTech ecosystem have their sights squarely set on insurance as the next great opportunity. 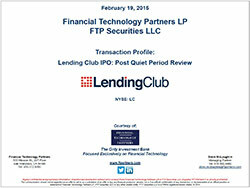 An in-depth analysis of U.S. FinTech IPOs over the past decade including yearly breakdowns by capital raised and FinTech sector, rankings of the largest IPOs by capital raised, best and worst performing and most recent FinTech IPO transactions, insight into pending IPOs, spin-offs and companies acquired while on file for an IPO and details on the most active investors in FinTech IPOs and list of the most well funded private FinTech companies. 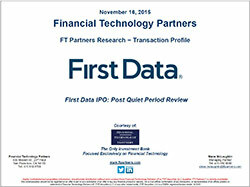 Detailed overview of First Data's IPO including its funding history, business operations, financial performance, public company comparables and relevant industry transactions. 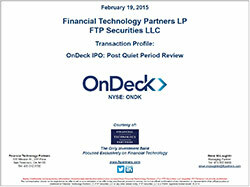 Detailed overview of OnDeck's IPO including its funding history, business operations, financial performance, public company comparables and relevant industry transactions.